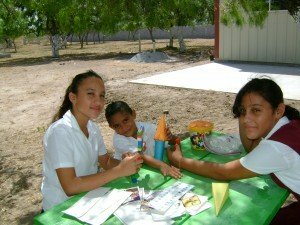 For over 35 years, Children’s Haven, aka “Refugio”, has provided a refuge for children facing difficult situations; poverty, abuse, abandonment, and the main reason, a family that has fallen apart. Though our funding has always been international, the focus of our love and Christian care has been on the needy children of Mexico. ENTER: Jacqueline, a lovely 12 year old, whose single mother brought her to Mexico, from Honduras, in 2006. Like so many others, Jahki’s mother’s plan was to cross the Rio Grande in search of a better future for her and her daughter in the US. Upon realizing how difficult and dangerous that would actually be, and without any resources to return to her homeland, she took a job here in Reynosa, cleaning newly constructed homes for less than $60 a week. The work was difficult, scrapping cement off windows and scrubbing floors, but at least she could have Jahki safely by her side. Until, at some of the jobs, she was told not to bring the young girl any more. After a few heart wrenching times of leaving Jahki alone for 10-12 hours, and being forced to lock her in the small room she rented in a bad section of town, Mrs. Erazos heard about CHI! In February of 2007, Jaqueline was brought to RIN. She came to us as a very timid child, but little by little she began to come out of her shell. She is an intelligent, beautiful, calm young lady. 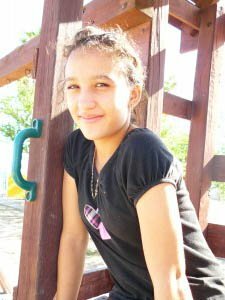 Although she still tends to be a bit shy, she has many friends and enjoys singing and participating in the various programs and activities at school and at the Home. She is a good daughter and the love she has for her mother is evident. Mrs. Morales visits regularly and is always in contact with Jahki. Jacqueline has repeatedly said how happy she is to live at Refugio and especially now since her niece & nephew are also with us! Jahki’s older sister, a single mother also from Honduras, brought her children Maritza (12 ) and Willian (6 ) to Oaxaca in search of a better life. Though able to find work, she had no time to care for her kids and was unable to keep them in school. When their grandmother, Jahki’s mom, told us about the situation, we readily agreed to take them in.